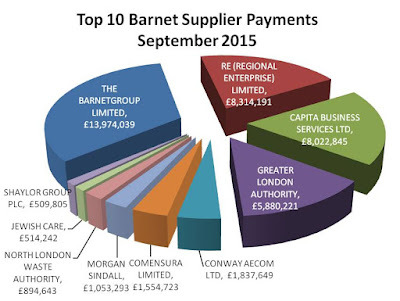 Barnet Supplier Payments - Will Capita's £16.3 million in September bust the budget? 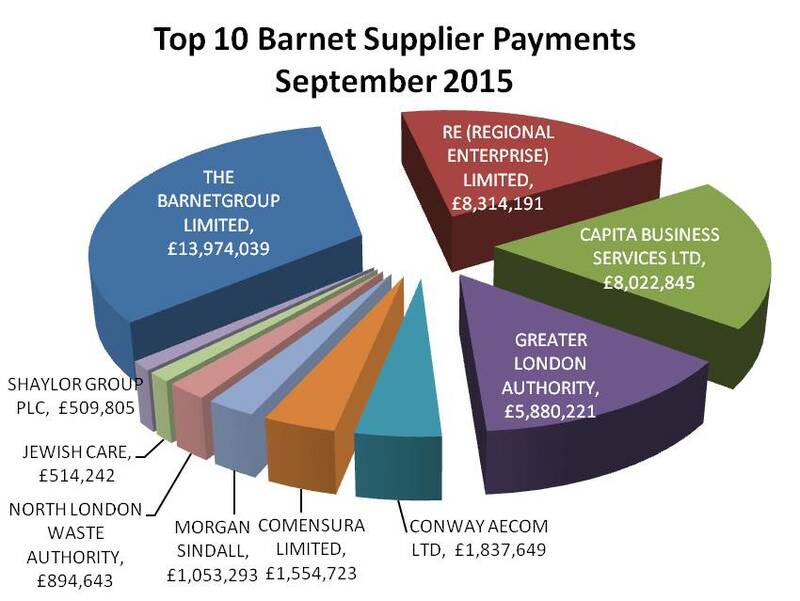 Supplier payments are out for September and yet again it has been a bumper month for Capita. Between the CSG and Re contracts, Capita was paid £16.3 million for September. This brings the running total to £39.5 million for the first 6 months of the financial year compared to £21.7 million for the first 6 months of last year and is more than the total value of the two contracts for the entire year, suggesting that Special Projects and Gainshare must be coining it in for Capita. Last financial year Barnet paid Capita a total of £51 million. This year, the budgeted payment to Capita is £41.8 million, see below, so if we have paid them £39.5 million in the first six months of this year there isn't a cat's chance in hell of hitting that target and I am increasingly concerned that the total payment for this year could easily hit £80 million. To reiterate a challenge I made to Richard Cornelius earlier this year, if he can demonstrate to me Capita are saving Barnet residents money overall, I will donate £250 to a charity of his choice. Another beneficiary has been Comensura who in September were paid £1.55 million and in the first 6 months of this year have billed a total of £9 million. I have raised my concerns about this contract previously and I remain convinced it is going to overshoot the £15.5 million Comensura billed Barnet last financial year. Also bear in mind that this contract is for temporary and agency staff yet it follows a period of mass redundancies. Previously I was told that this was because Barnet are struggling to recruit social workers so they have having to use agency staff instead. However a hole was blown in that myth when a freedom of information request revealed that social workers made up less than 20% of the agency spend. I also note that Conway Aecom received £1.84 million in September for all those roads that have been surface dressed with tar and grit much to the annoyance of many Barnet residents. There were also a couple of entries that caught my eye. The first was for £118,911.02 to a company called Senator International who supply office furniture. Given the libraries services are due to be decimated especially my local library in East Barnet it does seem somewhat strange to be spending this much money on new office furniture. I was also surprised to find that Senator International are not currently listed on Barnet Council's Contract register for 2015-16. Mind, it does say next to the contract register "Created 6 months ago, modified 6 months ago" so maybe it will find its way onto the register next time someone gets round to updating it - I wonder if there is a KPI for website updates given that procurement and website are both Capita responsibilities. The other company that caught my eye were Shaylor Group who were paid £509,805.22 for equipment and materials purchases and instructed by the Commissioning group. As with Senator International, I couldn't see them on the contracts register. Let's hope the update comes soon. Here are a few more payments that have caught my eye. The council paid TMP UK Ltd £51,501.99 for advertising and professional services. TMP UK describe themsleves as a "resourcing business that helps organisations hire and retain the right people by leveraging their employer brands". Given that Barnet is a commissioning council determined to outsource as many jobs as possible with a brand associated with cuts to vital services spending over £50k with this company seems a bit excessive. Barnet also paid Claer Lloyd-Jones £7,500 in September. You may remember Ms Lloyd Jones was brought in last year after the Committee allocation fiasco saying that "nobody" at Barnet had an understanding of Local Government law as set out in the Barnet Times here and on Mrs Angry's blog here. I wonder why, a year later, we are paying another bill for her services - we paid her £6,000 last year on 15 August. Have the problems been resolved or have Barnet just been very late paying the bill? As always, I will continue to monitor the payments - I just wish some of our councillors took a little more interest in just how much we are paying out. Last night was the Barnet Council meeting to discuss the future of libraries - the destruction of a brilliant service which is well used by the community. As is the case with so many council meetings, they determine the outcome and then arrange the debate around that conclusion. Barnet Council use a well worn technique of putting up absolutely dire proposals which they then pull back from slightly to say they have listened. In the case of the libraries the original proposal was to reduce some libraries to just 540 sq ft an entirely ludicrous proposal which was never the real plan. Now they have said they can be around 2,000 sq ft and we are all supposed to jump for joy and thank our lucky stars. However, for my local library, East Barnet, that means reducing the space by two thirds. East Barnet library was also listed as closing in one of the previous options. The new proposal is that it will be saved - woohoo! Except that it is now going to be a 'Partnership Library' which means it will be run entirely by volunteers - if they can be recruited and sustained and open just 15 hours a week. No paid librarians, in fact no paid staff at all, just volunteers. Last night Cllr Reuben Thompstone kept asking speakers "will you volunteer to work in a library? ", the classic 'when did you stop beating your wife' question. Whatever way you answer that question you are screwed. If you say yes, then that justifies the council's proposal to make the service entirely dependent on volunteers. If you say no, then the response is that you don't care enough to save your own library. The reality is that many people have to work two or more jobs just to survive. They don't have the luxury of receiving almost £26,000 in allowances as a Councillor chairing a committee. One questioner asked Cllr Thompstone if he would volunteer - no reply, no surprise. 134 questions had been submitted to the meeting demonstrating the depth of feeling. They also illustrated the numerous holes in the proposals; the unsupported assumptions, the lack of evidence, the wildly optimistic belief that they can deliver over £1/2 million pounds of rental income from space freed up in libraries. In East Barnet's case they reckon they can generate £54,000 a year in the space they will free up by cutting the library down to just 1,991 sq ft. Yet in New Barnet redundant office blocks which simply can't find tenants are being converted to flats. Under 16's will not be allowed into unstaffed libraries unless accompanied by an adult. The rather patronising officer who wrote the report and answered many of the questions last night said at one point "parents wouldn't want their children to use unstaffed libraries unaccompanied". Yes that is correct but parents do want their unaccompanied children to use STAFFED libraries and that is what we are fighting for. In East Barnet's case many local school children go there after school to do their homework - not everyone has the luxury of a quiet room at home where they can do their homework in peace. We are not just talking about secondary school children here. I recall when my children attended Danegrove primary school, just across the road from East Barnet Library, some parents couldn't afford after school club so their children walked across the road to the library where they were told to wait until their parents could come and pick them up; somewhere warm, safe and with opportunities to learn and have fun. That cannot happen when it is a volunteer only library open just 15 hours a week. Toilets will be closed when libraries are unstaffed which will affect parents with young children and possibly some older users. Yet Cllr Helena Hart moaned that at Edgware library the toilet was sometimes out of use because people had done 'unpleasant things' in there. Well Helena, have you thought what they might do in the unstaffed library? Will they trash the place, will they defecate on the floor. On no they won't because they will be CCTV - unmonitored so that several days later someone can go through the tapes and try and see which person committed this act. Not very comforting and one reason why so many people in the consultation exercise expressed their concern at using an unstaffed library. Cllr Dan Thomas kept asking what other suggestions questioners had to maintain the libraries at lower cost. Well actually Cllr Thomas there were many ideas put forward in the consultation process, all of which were ignored. Barnet are spending £6.5 million on new technology to diminish our service so I am sure with a bit of thought we could come up with alternative ways of making that investment to deliver a much better service. The council are going to spend £34 million to build a new office building at Colindale, highly inaccessible to those who live in the east of the borough. Perhaps libraries could have been developed into community hubs with council services co-located there, right in the middle of our communities saving a large chunk of the £34 million they intend to spend. The meeting was pushed along and by 8.30 pm it was all over. It will be referred to the full council meeting next week but, with a majority of one, the Conservative group will force this through in spite of all the concerns. So why the title to this blog? Well one thing that can be said about Barnet is that people care. 134 questions, a large meeting room full to overflowing with people forced to wait outside as there was no room for them. So many people who care about the libraries. I chatted with one conservative outside who told me he had paid his £3 to vote for Jeremy Corbyn to ensure Labour couldn't win the next election. We talked about re-nationalising the railways and other Corbyn policies and then he said, "look let's not talk about that. We are both here to save the libraries. It's a ludicrous proposal and I don't know why they are doing it". Barnet is a great place to live because of the people who live here, the people who care, the people who are passionate about their community. Mrs Angry, one of Barnet's most talented writers, quoted Mrs Thatcher who was a champion of aspiration. That is something Barnet residents have in bucket loads, but something deficient in the Council where the one overriding target is money. Stuff aspiration, stuff community, stuff the poor or disadvantaged - its all about the money. The council like to claim credit for Barnet's success but it is a great place in spite of the council rather than because of what they do. Destroying such a valuable community resource just highlights how out of touch the conservative councillors are with the community they are supposed to represent. Barnet Council are proposing to downgrade East Barnet Library to a "Partnership Library". It will be open just 15 hours a week, run entirely by volunteers and it will occupy just one third of the space of the current library. This is to save money apparently, although this will take at least three years before the council breaks even on their investment in technology, using their wildly optimistic assumptions about how much they will get renting out spare library space, in East Barnet's case £54,000 a year. My guess is that the space will never realise the £546,000 a year they anticipate across all the Barnet libraries making the business case even more spurious. Now you would think that this is a very underused facility to be cut so severely. In fact this is a well used library with more than 9,000 users and over 167,000 transactions a year. But what does that mean in reality. I've just popped into East Barnet Library to meet someone there. The place was full of children coming from school - with two primary schools and a secondary school on the doorstep. There was a mother and daughter working together on one of the computers and people on another three of the computers - one was out of order. There were four mature residents reading newspapers in the soft seating area. Librarians were dealing with a number of requests. The library was buzzing yet this is the same library that Barnet Council have deemed an unnecessary expense to either be run by volunteers or shut. So for all those children the alternative will be to get on a bus either to Osidge library which is to be halved in size to just 2153 sq ft or to Chipping Barnet Library. However, if the children are unaccompanied they probably won't get into either as Osidge will only be staffed for 15.5 hours a week and Chipping Barnet only for 23.5 hours a week. Outside those times unaccompanied children will be excluded. Barnet could have avoided this problem if they hadn't decided to cut the council tax by 1% just before the 2014 local election. A political hand out to buy voters which has cost us our library service. Cllr Reuben Thompstone will chair the committee on Monday which will push this through. If you disagree with the proposals to destroy our libraries email him at cllr.r.thompstone@barnet.gov.uk and tell him what you think.